Persistence is a mindset and a bedrock quality of the prosperous; couple it with intelligence and you have a very powerful combination. 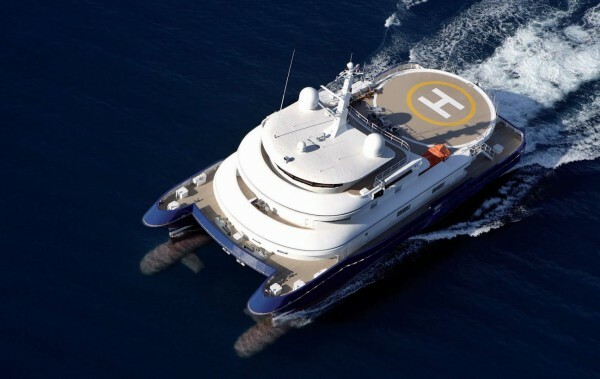 Alexander Dreyfoos Jr, owner of the 41m luxury SWATH vessel, Silver Cloud, would know – he has both. When Dreyfoos married the love of his life, Renate Jaspert, his yachting career reached an interesting juncture. It was now 2000 and he was heading towards a much-deserved retirement. He had spent his life around boats and dreamed of seeing the world, bit-by-bit, from a floating sanctuary. But, he had a problem: Renate couldn’t leave enclosed and tranquil waterways without being bowled over by seasickness. Fortunately, though, few were better placed to solve the problem than Dreyfoos himself, who graduated from MIT and Harvard Business School before an efficacious career as an inventor. On a roll…or not, as the case may be. 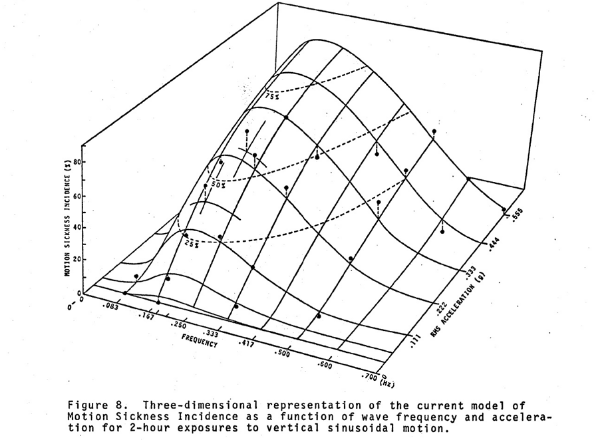 The 3D graph below shows Navy researcher Michael McCauley’s findings: a gaussian curve on a model of Motion Sickness Incidence as a function of wave frequency and acceleration for two-hour exposures to vertical sinusoidal motion. The vertical axis, amusingly dubbed ‘the barf axis’, shows the percentage of riders who become sick after the two-hour period. 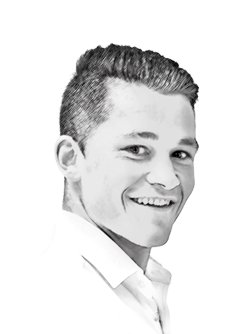 He exemplifies: “Say you’re in a rowing boat – it rocks very quickly when you’re off balance and it’s uncomfortable but you don’t get sick. Conversely, an ocean-liner will take 20-30 seconds to rock from side to side. “My point is, you don’t want to be in that six or seven-second swing frame. 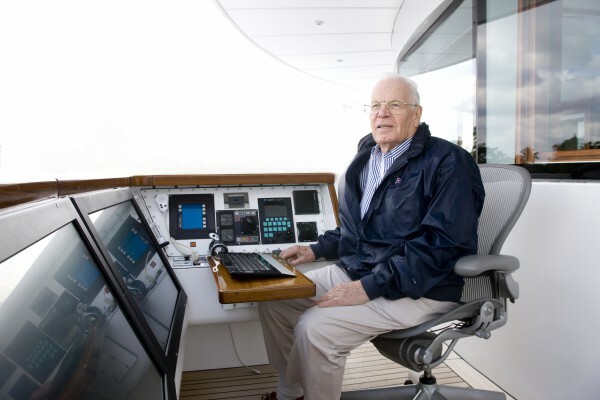 My Burger was in the five-second area and my Feadship was right on seven seconds.” With his newly acquired knowledge, Dreyfoos began researching non-traditional designs and wrote to the shipyards producing them. One Australian shipowner suggested he considered a SWATH. What is a ‘SWATH’? And why was it a suitable? The Small Waterplane Area Twin Hull (SWATH) concept was initially developed in the late 1930s by Frederick Creed and saw commercial development in 1968 when the first SWATH vessel was launched in the Netherlands. With their reduced rolling and pitching motion, general stability enhancements and reduced drag, the SWATH concept made a lot of sense over conventional monohulls for what Dreyfoos was trying to achieve. SWATHS have two torpedo hulls under the water in which you put everything that’s heavy and makes noise. Engines, generators, water makers, garbage disposal units and fuel and water tanks are all in the hulls. The problem was, the torpedo hulls on the earlier SWATHs were never built very strongly – in fact, there were a few incidents in which the hulls broke, so they naturally became out of favour. “The struts were breaking and causing all sorts of problems, however, I became convinced that finite element analysis computer programming would lead to a very strong design.” As the builder of many of the original SWATHs, the German shipbuilding stalwart, Abeking & Rasmussen, was the obvious choice for the project and was almost as keen as Dreyfoos to use the concept again. By March 2006, they had nailed down the design and specifications and went to contract. Abeking actually got elements of the concept design from The Boeing Company; they learned that thin aircraft wings, mounted vertically for use as the struts between the main hull and the torpedo hulls, were more efficient than thick wings. The yard then came up with a finite element design program that would allow maximum strength in the minimum size and weight. 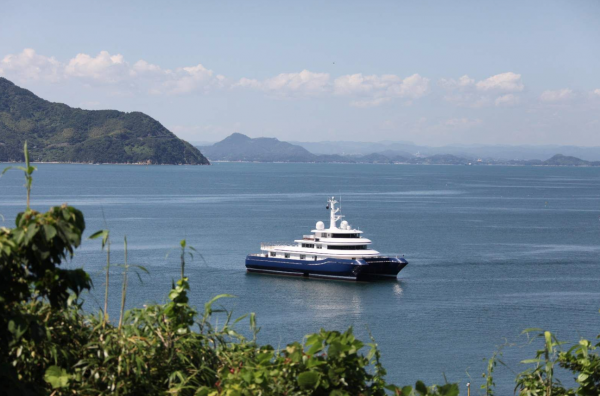 41m Silver Cloud is currently for sale with IYC. Measuring 41m in length, and with a beam of 17.8m and a volume of 926 gross tons, Abeking & Rasmussen delivered Silver Cloud in 2008; the very first luxury SWATH. And better yet, and almost needless to say, Dreyfoos was spot on with his theory: in the ten years since her delivery, Renate has never been seasick on board. “We have accumulated over 200,000 nautical miles at sea and I’ve been on board for 190,000 of them,” Dreyfoos continues. To put that into perspective, it’s 25,000 nautical miles around the earth, and while they have only been around twice, they have done enough mileage to circumnavigate the earth eight times. Now, stabilisation systems are so advanced that technology is able to mitigate the symptoms of motion sickness, however, I still admire Dreyfoos for finding a solution to his problem. He has subsequently lived an enriched yachting lifestyle that I’m sure few can match. The full article, in which Dreyfoos reveals his round-the-world cruising itinerary and much more, will be featured in issue 192 of The Superyacht Report.